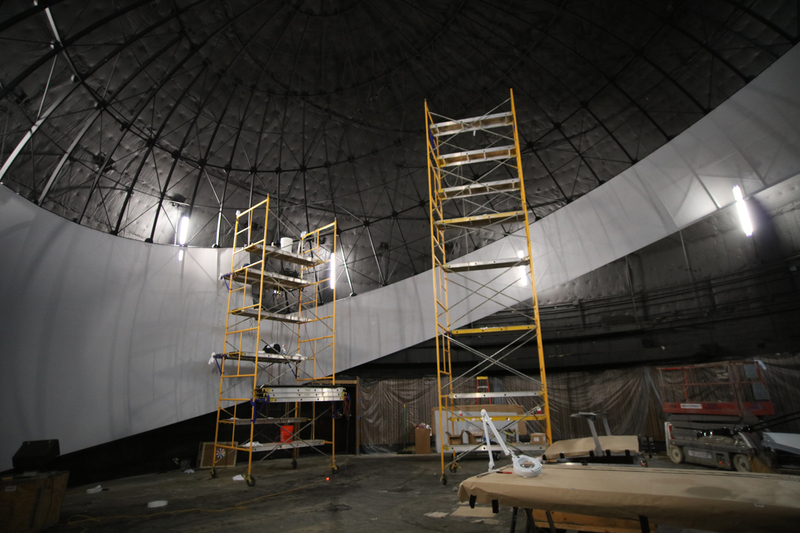 The Burke Baker Planetarium and Friedkin Theater renovation project reached a milestone this week, and we at the museum are brimming with anticipation! Okay. That’s an understatement. When we first heard the news, we all ran around screaming, “The dome is finished! The dome is finished!” That’s what really happened. The dome is indeed complete, and it was no basic DIY endeavor. 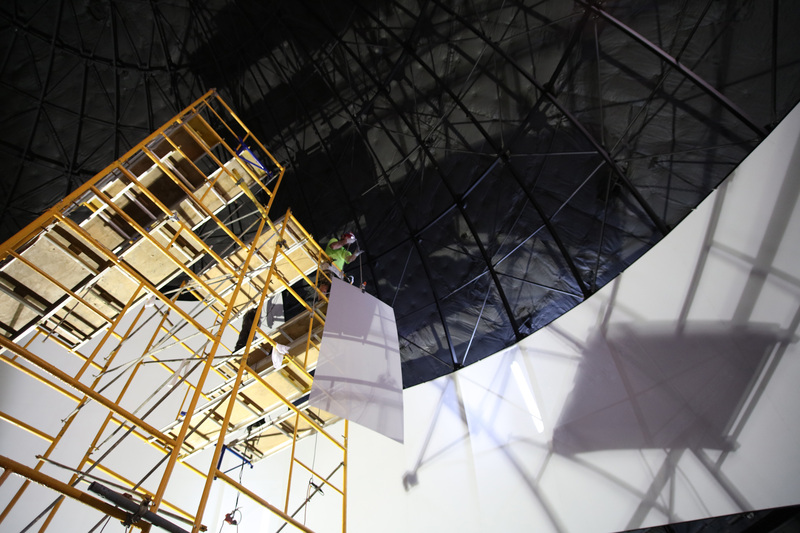 The Houston Museum of Natural Science’s Astronomy department budgeted an hour for the installation of each of the 197 panels installed. The old screen was removed and replaced first with support structures and next with the new screen, piece by piece, snugly tucked into place. 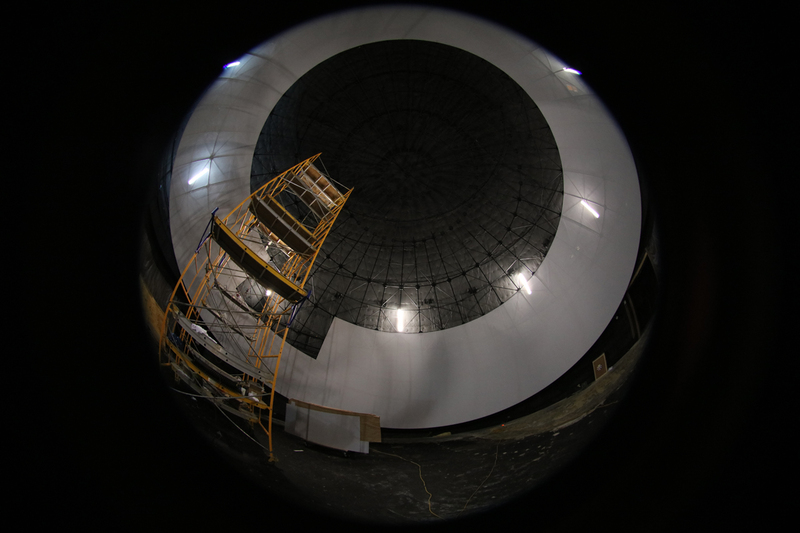 In a 360-degree shot, the new domed screen over the Friedkin Theater in the Burke Baker Planetarium looks like a giant cue-ball. It’s a painstaking process, according to Planetarium Producer Adam Barnes, the man behind our 360-degree custom-made films. He’s working on a time-lapse photo record of the installation that should be available on social media in the next couple of weeks. Once the old screen was gutted and recycled, Barnes explained, project crews shot 16 anchor bolts into the primary structure of the dome, then got to work on its “rib cage,” the support structure that holds the curved screen. The lowest-hanging portion was built first, then raised into place using come-alongs and chained to the anchor bolts at about 20 degrees. The front of the support structure is about two feet off of the ground at the front of the theater and about 20 feet in the back, giving the new dome its aesthetically pleasing tilt. Once the bottom rung was installed, the crew worked in a upward to the center of the dome, installing one rung at a time until the last circular piece was set in place at the top. With the old screen recycled, the next step is unpacking the scaffolding! With the bones of the theater set, each white panel was raised and placed, carefully measured and marked for size, then taken back down for shaping. The panels ship separately, pre-painted to a specific color rated to 45 percent reflectivity, perforated to make installing the rivets easier, and oversized for the tightest fit possible. Once each panel was measured, it was clamped onto a curved workbench and whittled down into the perfect shape, then re-hung into its final position. One by one, the panels are installed with careful measuring and alignment. One by one, the panels were installed around and all the way to the top of the dome in much the same fashion as the supports underneath them. The result is a smooth, seamless screen specially designed for domed projections. 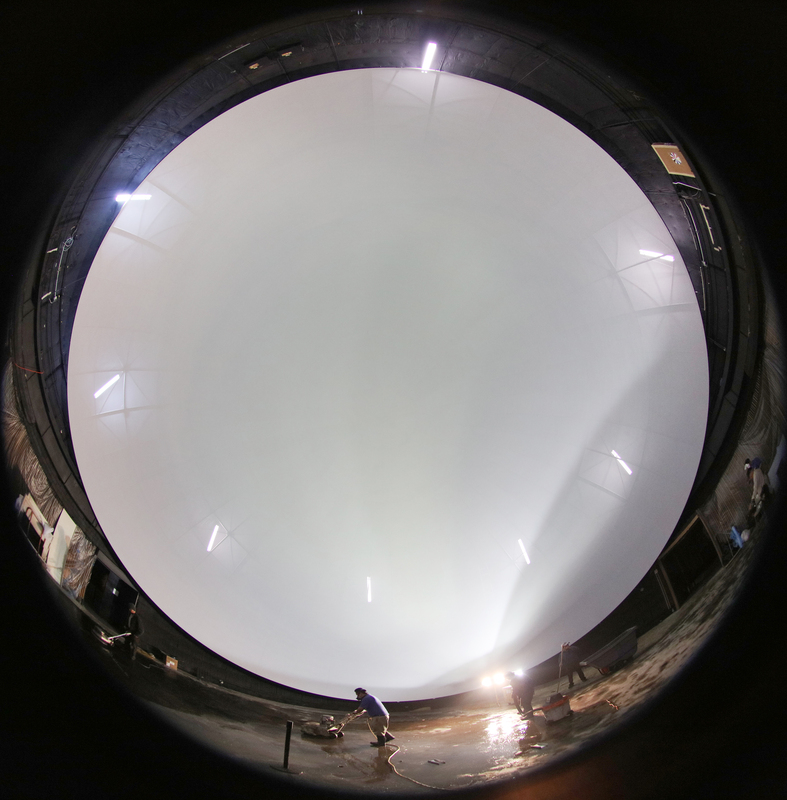 While most flat-screen theaters have a reflectivity of between 60 and 70 percent (a mirror would reflect 100 percent of light projected onto it), the dome theater’s lower rating actually allows the image to become sharper, though it may not bounce as much light back into the eyes of viewers. The interference of cross-talk is simply eliminated with a less-reflective screen, maximizing the power of each of the 50 million unique pixels pouring from the Evans & Sutherland Digistar 5 laser projection system. And with the tilt of the dome, guests receive a theater-like experience we’re sure they’ve never seen before. 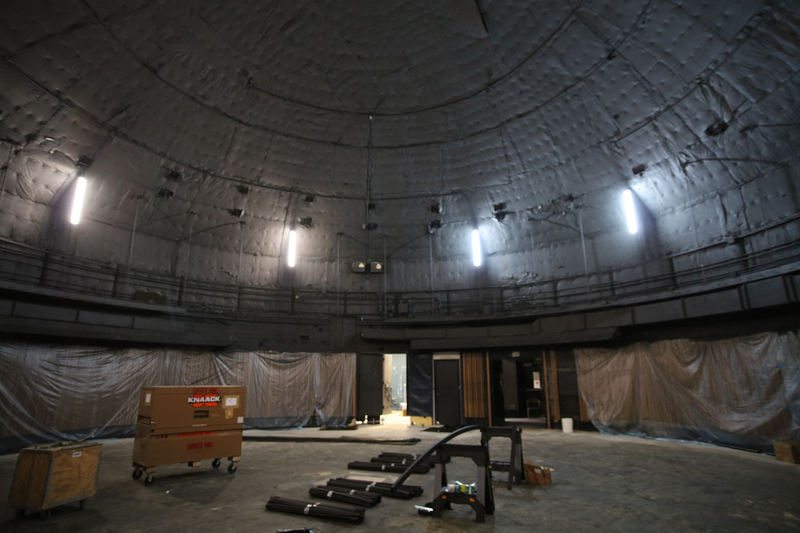 Mark on your calendars the grand opening of the newly renovated Burke Baker Planetarium and Friedkin Theater March 11. Don’t miss the show! Be the first to see the brightest planetarium in the world in action! Author’s note: All photos by Adam Barnes. Fabulous pictures of the new Dome! My family and I just became members and cannot wait to see this exciting new show at the planetarium. Marked my calendar for the 11th!